Rapid Screening of Phenolic Bioactives, Antioxidant, and Anti-diabetic Properties of Oat Using n vitr Assay Models. ● Whole grain and rolled oat from Doubting Thomas (MN) farm had highest total soluble phenolic content-human health relevant bioactives has potential to be targeted against non-communicable chronic diseases. 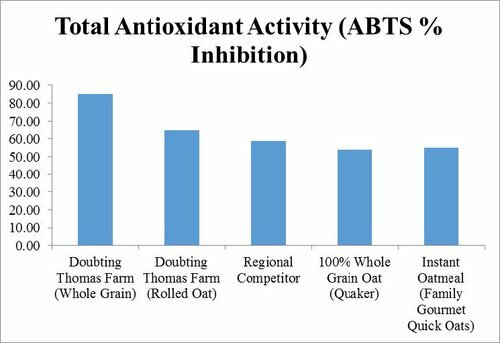 ● Similar to total soluble phenolic content, higher total antioxidant activity (both DPPH and ABTS based radical scavenging assay) was also observed in whole grain and rolled oat sample from Doubting Thomas (MN) farm-Significantly higher than commercial available oat sample. High antioxidant is relevant for managing chronic oxidative stress and associated chronic inflammation. ● Significantly higher glucose metabolism relevant in†vitro†α-amylase inhibitory activity (40-50%) was also observed in same oat samples. Most commercial sample did not have any significant α -amylase inhibitory activity. This result is relevant for anti-hyperglycemic functionalities and can be targeted against management of early stages type 2 diabetes. ● Mild to moderate in†vitro†α-glucosidase inhibitory activity was also observed in whole grain and rolled oat from Doubting Thomas (MN) farm and has relevant for dietary support against type 2 diabetes. ● Further inhibition of gastric ulcer relevant pathogenic bacteria ( Helicobacter†pylori†) was also observed with rolled oat extract and has relevance for human gut health benefits.